Comparing RT to a terrorist organization is “absurd” and “shameful” for a person in a position like BBG’s Andrew Lack, WikiLeaks spokesperson Kristinn Hrafnsson told RT, adding that its “understandable” given how WikiLeaks was treated. Hrafnsson was refereeing to comments made earlier this week by the CEO of the Broadcasting Board of Governors, Andy Lack. 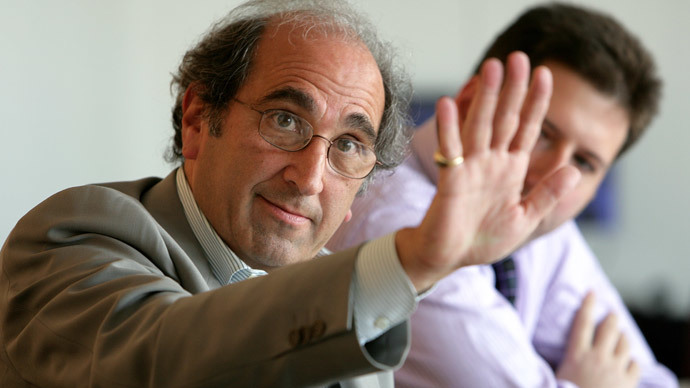 RT:Are Andy Lack's statements justified? Should RT be mentioned alongside jihadists and murderers? Kristinn Hrafnsson: It’s shameful that a person in this position should make this connection in the same sentence. It is absolutely absurd but quite understandable if you look at the other instances where people and organizations who are committed to investigative journalism have been treated. Don’t forget that WikiLeaks for example, a publishing organization, has been called a terrorist organization by US officials; let’s not forget that the spouse of a journalist Glenn Greenwald was detained at Heathrow Airport by the British Police on the basis of the terrorism act; let’s not forget that many US journalists have been under threat for being taken to court with references to similar legal mechanisms, so we are seeing a danger here in our world, where those in power are ready to use terrorism laws to silence journalists and media organizations. RT:What has been your experience of RT and its coverage of Julian Assange's story and WikiLeaks? KH: In my experience RT has been a good news source when it comes to matters that are concerning WikiLeaks and what WikiLeaks has published, for example, the very important chapters of the so-called international free trade agreements, the TTP in the Pacific and TESA agreement between the majority of Western countries. There have been many good examples of many good reporting. RT:Even the US State Dep backed away from Lack's words - so, is this a situation where the left hand doesn't know what the right one's doing? KH: In my opinion of course this man should be fired from his job, for this comment, which is absolutely absurd. And it’s within the role of the administration to reappoint and reposition him, as I understand it. So of course they cannot simply deny this comment it’s the responsibility of these people. RT:How does comparing RT’s journalists to IS terrorists fall in line with the ideas of free speech, so valued by Washington? KH: The value of free speech in Washington doesn’t seem to go very far. In theory in the United States of course there is a very strong protection of freedom of speech, and for the work of journalist, even in a point in the constitution it has a mechanism defending journalists and media organizations, but more and more over that last few years there’s been a very serious trend in the direction where journalists are under attack and attacked, being intimidated, being threatened and of course totally in contrast with the official story. The official narrative of the United States being the bastion of free speech and quality protected journalism. RT:Some American officials accuse RT of being one-sided. Do you feel the coverage you see in the U.S and beyond always gives both sides? KH: No certainly not and you only have to look at some of the major news organizations in the US and let’s not forget for example that a large portion of the US population gets all its news and view to the outside world through news organizations like Fox News, which obviously is not balanced in any way. As a journalist myself for a few decades I will say that in our media environment we should always be prepared and evaluate a possible bias in any reporting and that applies to all media organizations including RT. Usually as a consumer of news, to get a clear picture you will go to various media organizations to try to get a balanced picture of the state of affairs though various sources. That’s what every consumer of the media these days should keep in mind.